You might remember America's diner from the Tim Allen movie "The Santa Clause". I certainly do. 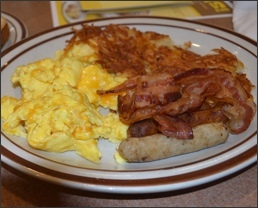 Denny's is the symbol of convenience in dining where breakfast can be dinner and the other way around without any strange looks. We were tired. Extraordinarily tired, after a long trip east, and wanted to find a place within straightforward access to Highway 401 which was our reliable way home. 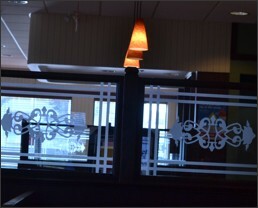 Since it was around 11 in the morning, Denny's appeared to be a good place for some comforting food. There aren't many surprises on the menu, and the waiting staff were warm and cheerful for what had otherwise been a very cold, dreary day. I ordered an All-American Slam - a plate with sausage, hash browns, eggs and toast. 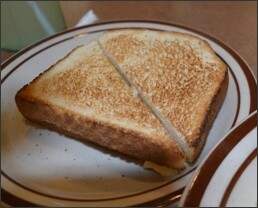 It was wonderful homestyle food but I wanted more of it despite the full plates. To quench my thirst, I had some lemonade which is an unusual choice in restaurants, albeit delightfully tart. A new favourite. The bill was also delightful.